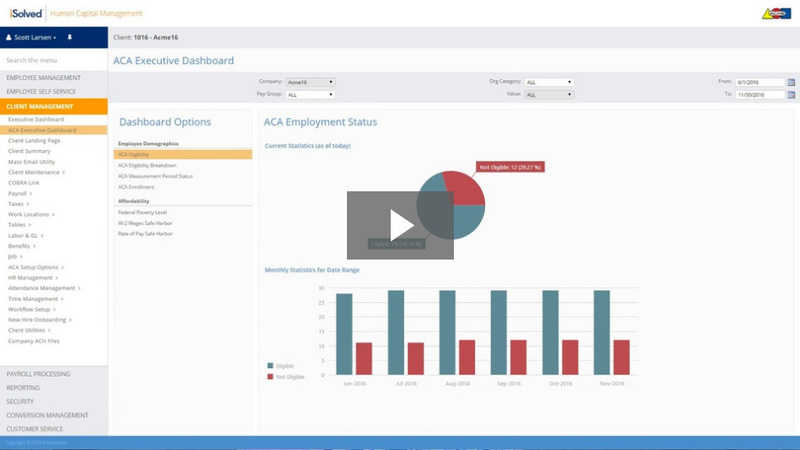 iSolved lets you clearly and easily determine your Affordable Care Act compliance with employee types, status and more. All with the push of a button. Who is the filer of forms 1094-B & C and 1095-B & C? The entity who is legally obligated to file is the provider or plan sponsor for purposes of Forms 1094-B and 1095-B. For purposes of Forms 1094-C and 1095-C, the entity who is legally obligated to file is the ALE. What is the effective date of this requirement? January 1, 2015. Which means that all providers, issuers, marketplaces and self-funded plans must comply this year. ALEs with 50 or more full-time employees (FTE) in 2015, based upon the 2014 look-back, must comply in 2015 and report in 2016. This requirement is separate from when al ALE becomes subject to the employer mandate (ALEs with 50-99 FTEs are not subject to the mandate until 2016, but are still required to file for 2015). Must the filer be a tax preparer? No, most filers at the employer level (for small, self-funded plans and ALE) will be someone on either the executive or administrative team. The exception here is if the employer is working with a CPA or third party human capital management or payroll provider that is assisting with the form completion, filing and distribution. Do I have to read the forms and instructions thoroughly to begin the process? Absolutely, yes. The IRS states this step is crucial for any provider, plan sponsor or ALE to even begin to understand what they’ll have to do. Can the forms be completed & mailed prior to the end of 2015? No. Reporting for the 2015 calendar year means that each of the 12 months must be accounted for on the forms. Any incomplete reporting would require a corrected return. Forms are due to participants and ACA-defined full-time employees by January 31, 2016. What address do providers, issuers, plan sponsors and ALE use to mail the 1095-B or 1095-C to the participant or full-time employee’s home? Regulations state you mail the form to the last known address by first class mail. It would be prudent to obtain an updated mailing address for anyone who cancelled coverage or terminated employment. Ca the 1095-B or 1095-C be provided electronically? Yes. The provider, issuer, plan sponsor or ALE must have affirmative consent from the recipient to receive these forms electronically. Call us today (866) 992-5205, or use our online contact form below, to learn more about how Payroll Control Systems and iSolved® can improve your implementation of the Affordable Care Act for your business.